Set of FAQs discussing the benefits and concerns of using grounded vs. ungrounded thermocouples. Thermocouples are typically used for high temperatures (compared to RTDs), in high-vibration applications, and when a fast response is needed. Using a grounded thermocouple has some benefits, but also carries some risks. What does ‘grounded’ or ‘ungrounded’ mean when it comes to thermocouples? Thermocouples are made from two wires of different metals welded together at a point called the junction. That is the spot where the actual temperature measurement is taken. Thermocouple sensors are made up of several elements: metal sheath, thermocouple wires, and the junction. 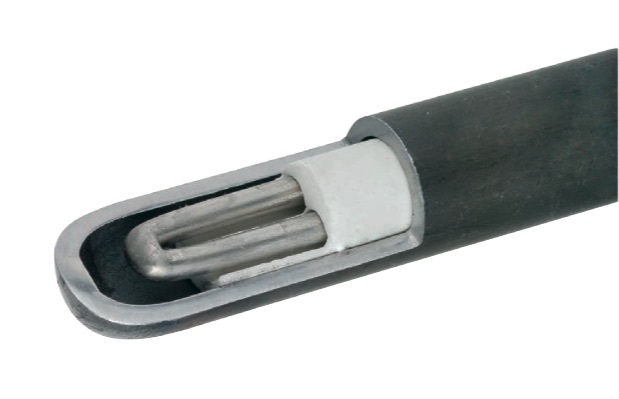 A thermocouple is grounded when the junction is welded to the sheath at the tip of the sensor. In an ungrounded thermocouple, the junction does not touch the sheath. What are the main differences between a grounded and ungrounded thermocouple? Grounded thermocouple: This type of temperature measurement device has the advantage of more efficient heat transfer. With the junction welded to the metal sheath, a grounded thermocouple will respond faster to temperature changes because the metal-to-metal contact creates a shorter thermal pathway compared to an ungrounded thermocouple. However, this grounding can create an undesirable side effect. By welding the junction to the sheath, an electrical connection is also made between the wires and the sheath. This can lead to a “ground loop” if the sensor is connected to earth ground at the point of measurement and if the wires are connected to a controller, which is grounded in another location. The two grounds may not be at the same voltage potential, thus creating an undesired circuit that may damage equipment. Ungrounded thermocouple: An ungrounded thermocouple is not welded to the metal sheath and typically has nonconductive powder, like magnesium oxide, surrounding the junction at the sensor’s tip. This material slows the thermal transfer from the media being measured to the junction of the thermocouple. Because the thermocouple wire is electrically isolated from the metal sheath and case, using an ungrounded thermocouple reduces the risk of ground loops. How do I know if I have a ground loop? The effects of a ground loop can vary. The measuring instrument may become more susceptible to weather changes and provide unstable readings. In some cases the measuring device may become electrically damaged and stop working. In extreme cases, there may be smoke. How do I prevent a ground loop? A good rule to follow is to have only one ground in an instrument loop. You have two choices: Ground either the transmitter (connection head) or the controller/recorder, but not both. Selecting transmitters that have internal isolation between the input, output, and ground usually provides enough isolation to eliminate a ground loop. Loop isolators are also available and can be put in the loop wiring circuit to prevent this from happening. Although many new temperature transmitters have internal isolation, using an ungrounded thermocouple is the failsafe way to eliminate ground loops.